Always been a perfect blend of culture and British sophistication. Fresh climate and mesmerizing landscape round the clock makes it a tourist-friendly destination. Everyone might have visited Shimla, but there are very few people who want to try some offbeat destinations. Interior areas of Shimla district are yet to be explored by the enthusiastic travelers. The 3 offbeat places which top explorers listed are Chanshal Pass, Dodra kawar Villages and Buran Ghati(covering Chandernahan lakes). These all 3 places can be visited by a single route, and believe me this route is just awesome. When you start from Shimla early in the morning your trail covers Kufri, Fagu, Chela and then crossing several orchards by Kotkhai you will reach Khadapathar. Khadapathar is situated at the height of 8,770 ft. Then you can visit Hatkoti temple on the way to Rohru. It takes only 3-4 Hours to reach Rohru from Shimla. Once you reach Rohru, there you will find a beautiful town in the bank of Pabbar river. You have several options to explore there like some treks- (Chandernahan trek, Buran trek, Chanshal lake trek, Dodra Kawar villages) etc. One can also explore Chanshal ghatti which is really a very beautiful place for camping. The main road which leads you to Chanshal or Chandernahan is beside Pabbar River and are really mesmerizing. Camping beside Pabbar river is a must experience thing. It’s really awesome to camp nearby river and enjoy fishing and bonfire. You will find locals extremely cooperative and the villages full of heritage. You can stay at a hotel in Rohru or can arrange a homestay. But an explorers recommendation will always be a camping site besides the river. Then next day you can choose Chanshal to pass with Dodra Kawar villages jeep safari or can go for a super awesome trekking route of Buran pass. Below are the details of what these places are all about. Chanshal Pass links Dodra Kawar and Rohru (Chirgaon) in the Shimla district of Himachal Pradesh. Right at 14,830 ft is the Chansal pass which is also the highest peak of Shimla district. The access to this pass is limited only between May and October however, you will have snow clad mountains for the rest of the year. Chanshal pass is one of the best camping and sunset sites in Himachal. One can camp there or can choose the Chanshal lake trek which is a short trek of only 2 days. If you are a first-time trekker then Chanshal Lake Trek is ideal for you. It is almost a straight trek of 8kms with few slopes. It is truly a heaven for nature lovers. Don’t miss the sunset there. The two villages which are secluded in the Himalayas are the Dodra and Kawar villages. Rupin river most commonly known as the tributary of Yamuna river bisects these two villages. These eternal and pristine beauties have been made accessible through motorable road constructed in 2009. Fast flowing streams, waterfalls, cedar, rhododendron forests and scintillating beauty of fresh flowers continue to keep you enchanted. Construction in the village and local temples demarcate their skill with wood. Dodra and Kawar villages are one of the most sought-after destinations offering offbeat travel experience. Due to the geographical limitations, accommodation options are either a homestay or government rest houses. You will be blown away by local’s hospitality no matter which option you choose. Shimla district in Himachal Pradesh is an unexplored trekking destination with easy to moderate difficulties. 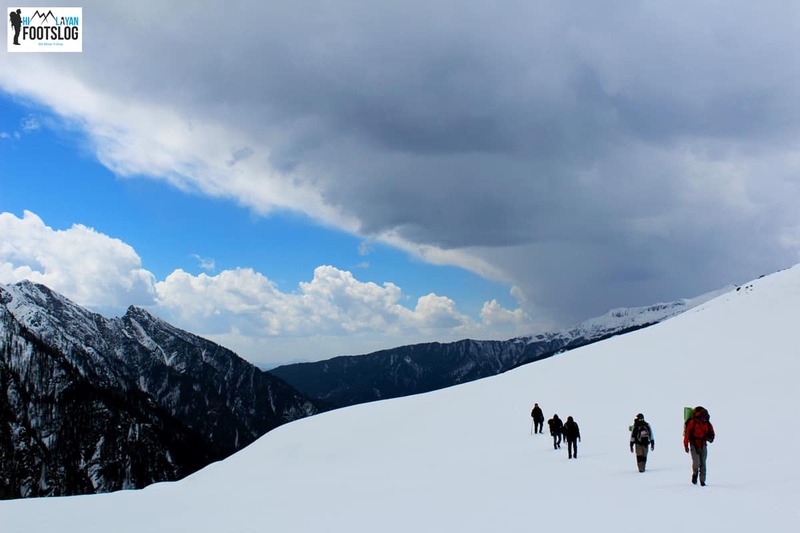 One such trek is a Buran Pass Trek which served as a pastoral way between Pabbar Valley (Shimla district) to Sangla Valley (Kinnaur district), which involves the crossing of Buran Ghati (15500 ft climb). This trek is a blend of lush green deodar and pine forests. View of watershed, waterfalls, meadows, and lakes add to the beauty of this trek. So you can call it a buffet of the entire great Himalayan trek. Janglikh near Chirgaon in Shimla district has convenient road head and can be approached from Shimla via Narkanda or Khadapathar. The trek ends in Burwa village which is a road head destination. A picturesque Dhauladhar range covered in snow and fast gushing streams continue to keep you mesmerized. Experience of camping at Buran ghatti is once in a lifetime opportunity. So, the next time you plan for Himalayas or Shimla considering exploring these options to make your journey a memorable one.